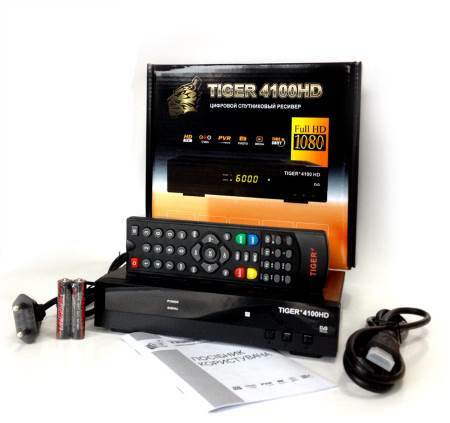 • Tiger 4100HD - an inexpensive HD satellite receiver for the reception of TV and radio channels DVB-S/S2 standard. • Issued to replace the 4050HD models, developed on the new processor Ali 3510A. • To reduce the cost of the receiver with Lan connector has been removed, but to connect to a local network or the Internet, you can use an external USB Wi-Fi adapter. • At the same time Tiger 4100HD functional capabilities are not inferior to more expensive models. • Equipping the receiver is quite modest, but it contains all the necessary switching connectors. • The front panel, in addition to the navigation buttons, the power button and status indicator, together currently four seven-segment display. • On the rear panel are located compact satellite antenna input, service the RS-232 connector, USB and HDMI interfaces, audio-video connectors for analog connections and the power switch. • Connect the receiver to your TV, you can use the digital HDMI or analog RCA outputs. • The HDMI will provide maximum image quality with 1080p output resolution. 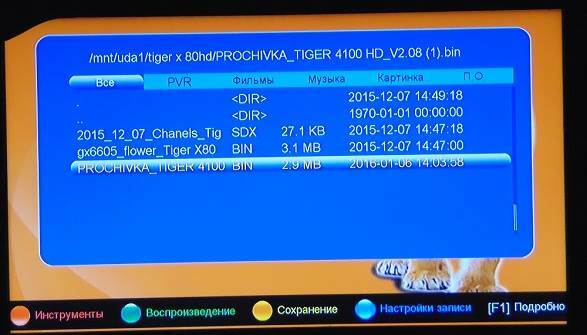 • The satellite receiver Tiger 4100HD has a built-in media player with support for major audio and video formats. • Also on the receiver, you can view pictures from an external USB drive. • Support for standards: DVB-S, DVB-S2 . • Support for digital coding standards: MPEG2, MPEG4/H.264 . • protocols DiSEqC version 1.0; 1.1; 1,2/USALS. • Memory up to 10,000 channels (TV and radio). • Fast switching between channels. • Easy to create their lists of favorite channels. • Electronic Programme Guide - EPG . • The "Protection of children». • Software update via USB. • Video recording and playback (when the USB drive is connected). • Supported formats playable files: jpg, bmp, gif, mp3, ogg, flac, wav, mpg, avi, 3gp, mkv, mp4, mov, ts, m2ts, dat, vob. Support for external Wi-Fi adapter. 6. After the upgrade, reboot the receiver.